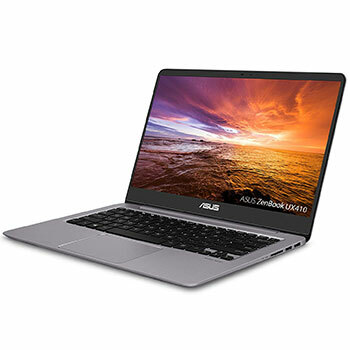 Here are ASUS Zenbook UX410UA-AS74 drivers for Windows 10 64 bit you can download and install to get you laptop work properly. ASUS Zenbook UX410UA-AS74 is 14-inches laptop powered by 8th generation 1.8 GHz Intel Core i7-8550U quad-core processor with integrated Intel UHD Graphics 620 video card. It comes with 8 GB DDR4 SDRAM memory that can be upgraded up to 16 GB. It also comes with 1TB 5400RPM SATA HDD and 128GB SATA3 M.2 SSD Solid State Drive to store your videos, musics, and project files. It features HD web camera, backlit chiclet keyboard, HDMI port, Type A USB3.0, Type C USB3.0, and 3 Cells 48 Whrs battery.